SEO refers to optimizing pages of your website to be well understandable by search engines so that they can index ('crawl') your site properly. 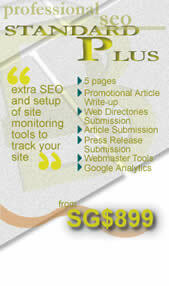 We provide professional, legal and ethical SEO services. Our SEO consultants are experienced in optimizing the many sites you see on our portfolio. How do we perform SEO? Titles, dynamic meta description, meta keywords and image alternate tags are some ways we use in all our designed pages to ensure proper page indexing by search engines. These are all legal and accepted methods. Find out more on our SEO techniques. No SEO company can guarantee you a top ranking position in any search engine. Read more on our SEO Scams page. 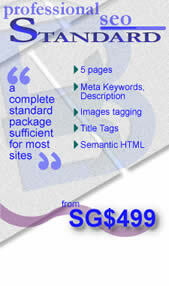 The basic package is sufficient for most static websites. If your site is a blog (e.g. Wordpress, Blogger) or CMS powered, it will require manual coding to dynamically generate the meta tags. If so, please contact us with your site's web address for a quote. If your site is a blog (e.g. Wordpress, Blogger) or CMS powered, it will require manual coding to dynamically generate the meta tags. If so, please contact us with your site's URL for a quote. Once we receive your Search Engine Optimization request, the following is an estimated timeline for each week. Analysis of site and collection of 50% pre-payment. Here is how we analyze your site. Submission of site to search engines, web directories. Submission of article to articles and press release sites.